Walmart workers, both store and warehouse, have been organizing and defying management of the largest company in the world. 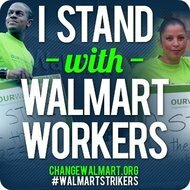 They are asking for people to not shop at Walmart on Friday and to support their walkout to pressure the company to improve working conditions and wages. This video from Brave New Films provides both stunning visual images of this worker struggle and it gives voice to those workers with testimony from numerous Walmart employees.